During World War II, Wojciech Narebski and his fellow Polish servicemen had to lift crate after heavy metal crate of artillery. Fortunately for them, one of the soldiers had superhuman strength: Corporal Wojtek, a Syrian brown bear. “When he saw that we were struggling, he’d want to help… He’d come over, grab a crate and carry it to the truck,” Narebski, now 93, told AFP of his days with Wojtek in the 22nd Artillery Supply Company. This can be heavy work, even for a bear. When Wojtek got tired, he would simply stack one crate on top of the other, “which also helped us, because we didn’t have to lift the crate off the ground,” recounted the veteran who spent two and a half years with the friendly giant he considered a brother. Wojtek the Bear also liked to drink beer and smoke (or rather eat) cigarettes, take showers, snuggle with his handler at night, and wrestle with his comrades. When an opponent lost, Wojtek would lick their face in apology. Old photos show the bulky beast — who grew to be over 1.8 meters (six feet) tall and weighed about 220 kilogrammes (490 pounds) — giving bear hugs, opening his toothy jaw wide for food, and enjoying a day at the beach with smiling soldiers. The unbelievable true story of the orphaned cub, which was found by Polish troops in Persia and then traveled through Iraq, Syria, Palestine, Egypt, Italy and Scotland as a morale-booster, is now being turned into an animated movie. The British-Polish filmmakers hope to release the family-friendly “A Bear Named Wojtek” in 2020 on the 75th anniversary of Victory in Europe Day. But the film’s British producer, Iain Harvey, was skeptical when Scottish animator Iain Gardner first approached him. “When you actually find a story that is almost like a fairytale but is real, and documented and true, it just opens up so many more emotions I think,” he told AFP. “You know, that humanity can have magic and that things can happen that you wouldn’t normally think are rational,” he went on. Not that all the lore is true. Wojtek probably did not visit the Sphinx in Egypt, as recounted by some storytellers. Nor did the Nazis necessarily know they had a special animal enemy and bombard his positions. Sometimes truth is stranger than fiction, however. Docile Wojtek was an enlisted soldier, with his own paybook, rations, and rank — a status he needed to sail from Egypt to Italy with his comrades in arms. “The port authority is being difficult about the bear and monkey,” reads a 1944 entry in the company’s journal. Yes, there was a monkey too. In fact there were hundreds of non-humans milling about during the war, according to wartime Polish refugee Krystyna Ivell, who herself had a chameleon in Palestine. 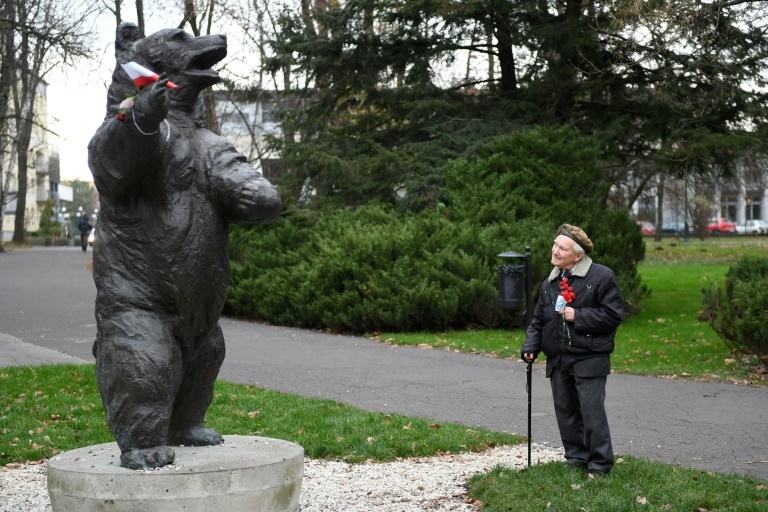 “You have no mother, you have no sisters, you have no father, you’re all alone, you might die, so of course you find something to love,” said the 83-year-old, who put together a London exhibition and compiled a book: “Wojtek Album”, with photos and anecdotes about the bear. “Stray dogs. Foxes. Horses. You name it. Everybody wanted a pet… I remember a bloke who had a ferret, and used to have it under his khaki shirt and the head would appear,” she told AFP. What was special about Wojtek, according to Narebski, was that he seemed to believe he was human. “Because he was brought up from a cub among people, he acquired human traits… In a bear’s body there was a Polish soul,” said Narebski, who was known as “Little Wojtek” and the bear as “Big Wojtek”. He recalled an occasion in Italy, along the Adriatic Sea, when the hairy Corporal Wojtek managed to break away from the men and make a beeline for the water, giving beachgoers a fright. This docility is what Gardner, the animator, finds interesting about the imagery of a bear in a human conflict. “The most common kind of cultural shared image that we have of a bear is that it’s a savage animal. You know, it’s a beast,” Gardner said. After the war, Wojtek ended up at Edinburgh Zoo in Scotland, where he died at the age of 21 in 1963.